A collection of great Joseph Lycett (ca.1775-1828. 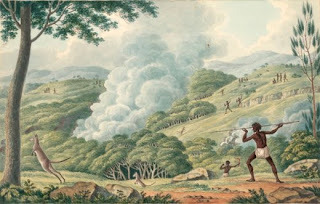 )paintings depicting Aboriginals can be found at the National Library of Australia. What conclusions can we draw about the life of aboriginals in Australia based on these paintings? Which is your favourite and why? What other information would you like to discover? What sources would be valuable to a historian examining aboriginal society and culture in the early years of the 19th century? Australian Aboriginal in a Classical Pose?